See your property in a whole new light. 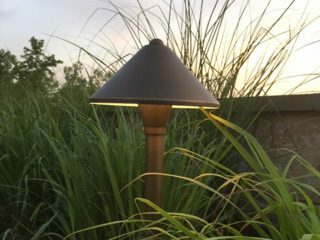 Landscape Lighting is a simple way to extend the use and enjoyment of your patio/landscape into the evening hours. 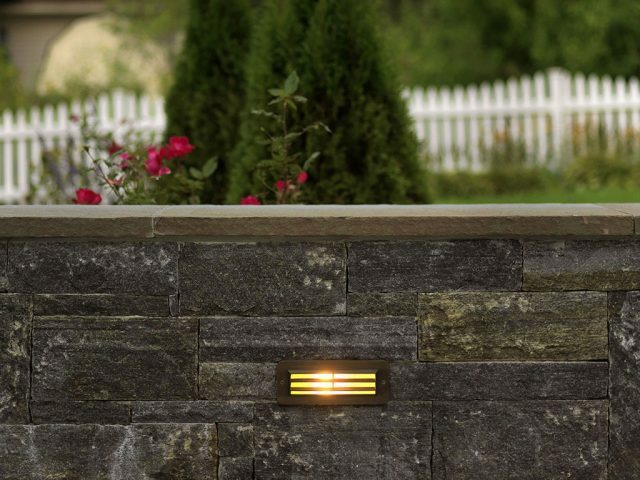 The use of low voltage LED lighting can create a welcoming ambiance to your front walkway, highlight specific features and give a warm glow to your landscape overall. 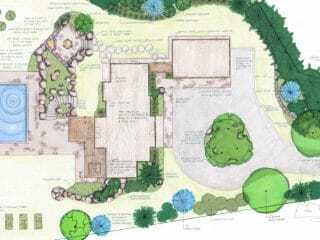 Our designer can work with you to create the perfect lighting plan to meet your needs and your budget. 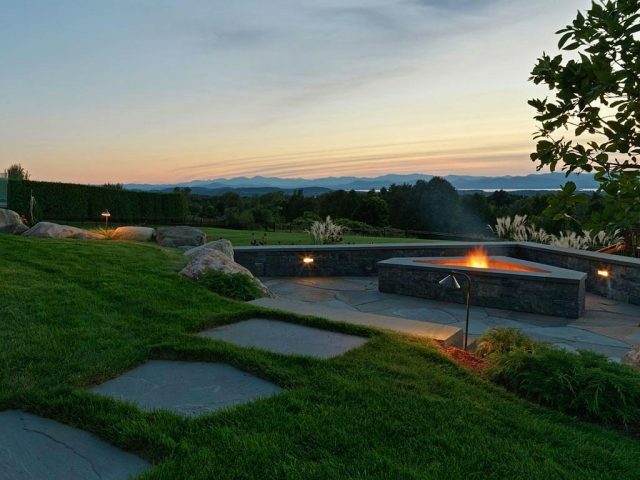 Lighting can be incorporated into your landscape in a variety of ways. 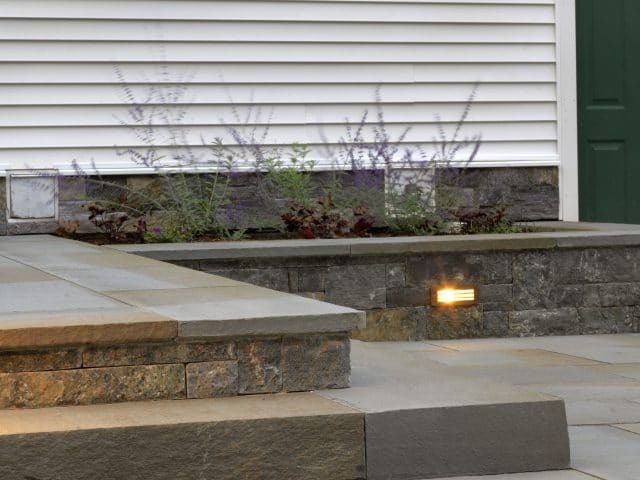 These include path lighting, up-lighting and wall or step lights. All of these types of lighting can be used individually or combined to create the perfect lighting plan for your home. 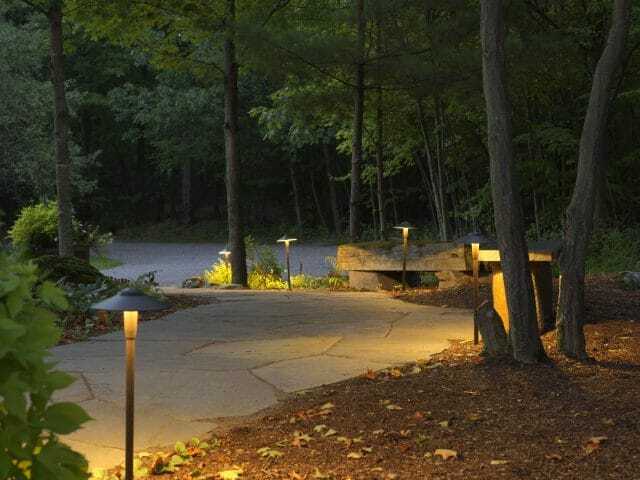 Path lights can be used in two ways in the landscape. 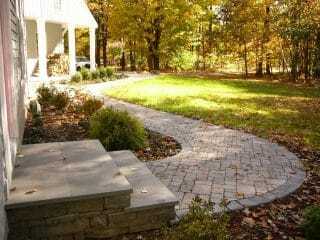 They are most commonly used along walkways and patios to guide a visitor to the door or entertaining area. 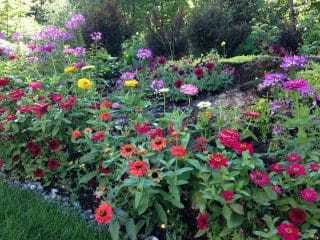 Sometimes path lights are used in the garden beds to illuminate your colorful perennials and groundcovers as well. 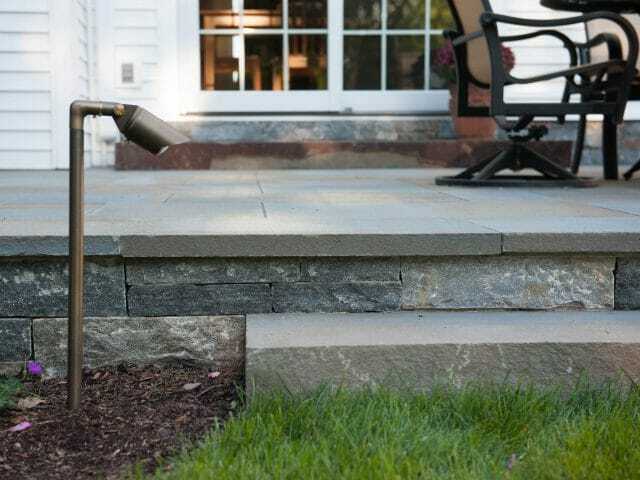 There are so many different styles, shapes and sizes to choose from, that there is sure to be a fixture to fit your style and budget. 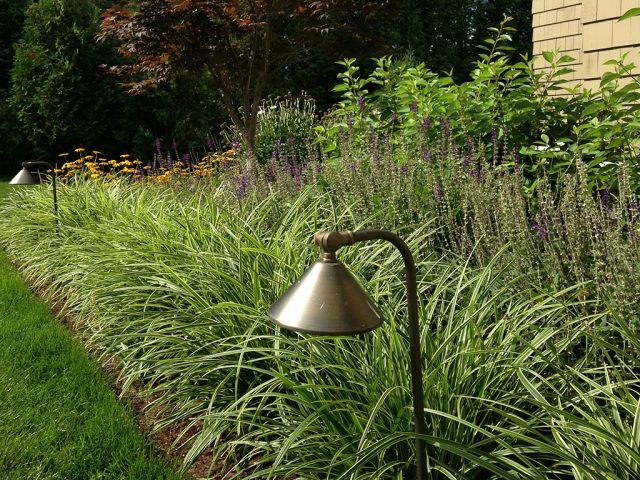 Up-lighting is used when you would like to highlight specific elements in your landscape. 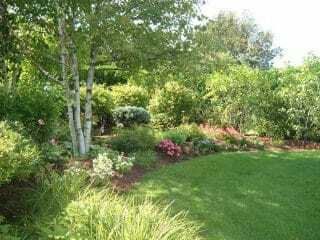 Something like a beautiful clump birch tree in your front yard or a water feature that you want to enjoy in the evening. 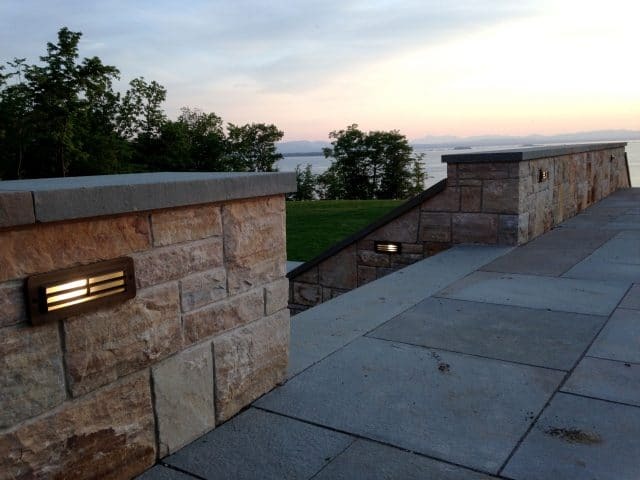 Wall or Step lights can be incorporated into the stone walls and staircases that we build. This subtle use of light illuminates spaces with a soft glow. The use of lighting in staircases is often used as a safety feature if they are going to be frequently used in the evening. 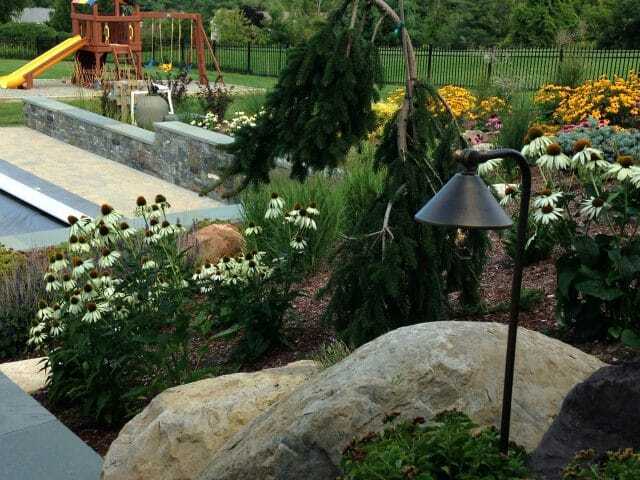 The landscape lighting that we install is low voltage and we use LED bulbs. Many of our clients choose to incorporate photo-cells with their lighting packages. This allows the lights to automatically turn on when the sun goes down and shuts the lights off when the sun comes up. This way you never have to think about flipping a switch. Of course that is an option too!